Welcome to our 2016 Spring edition, and thank you for your continued support to help keep our park beautiful. The Friends of Shrewsbury Park was formed in 2006, and to help celebrate our 10th birthday, we have a busy, varied calendar of events planned for 2016. 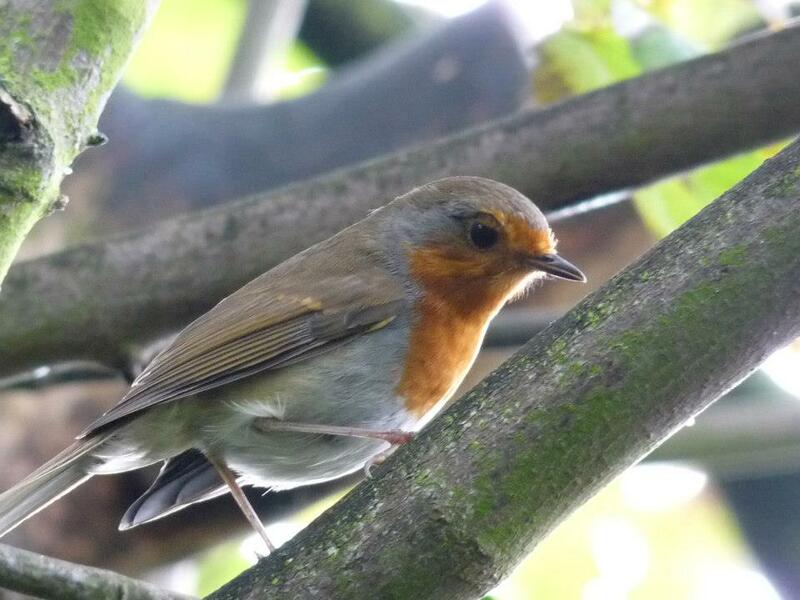 This includes bird, bat , butterfly and historical walks, plus a new walk on tree identification. We will be holding a weekend of fun in June, with our Summer Festival on the 11th, and dog show on the 12th. We will of course keep you informed of the events via emails. For members without email, we will be putting posters up on the notice boards in the park. The photographic competition produced many beautiful photographs for the 2016 calendar, please continue to send your photos in for the 2017 calendar. We continue to fundraise for £8000 to provide a drinking water fountain in the park. We raise money at our Summer Festival, on the sale of the calendars, and we apply to Companies and Trusts for help. To become more inclusive, we stopped asking members for subscriptions in February 2011 although this would have raised an additional £700 per year (our membership now stands at 368). If you have any ideas on fundraising to help us achieve the drinking water fountain, please get in touch. 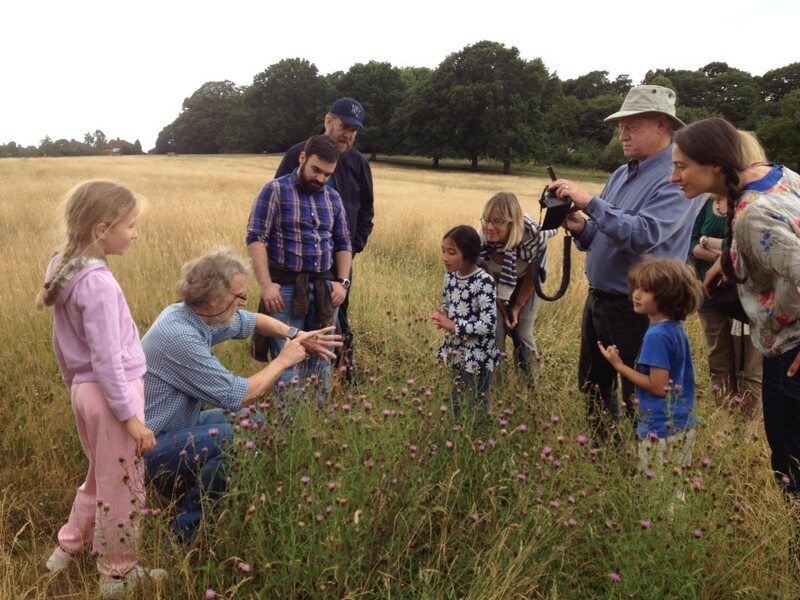 John Denton provided our first butterfly identification walk which was enjoyed by children and adults as they learnt not only how to identify butterflies, but also their habitat. The event, as always, was well attended, the majority of people coming for the fabulous Dog Show. 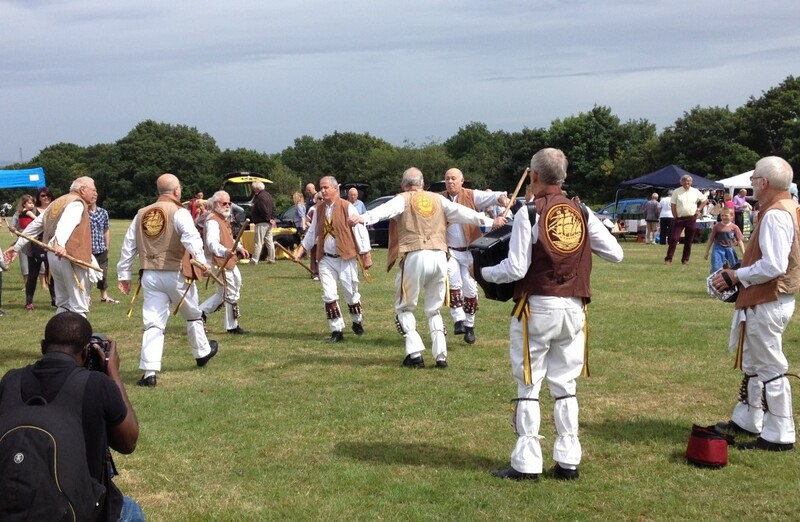 We also had The Blackheath Morris Men, who as well as dancing, provided tuition to participants that enabled them to take part in a dance. The Greenwich Community Rock/Pop Choir provided song sheets and tuition to participants that enabled them to sing harmonies to songs. Our evaluation forms showed that people enjoyed the Morris Men, the Choir, the Police, the Dog Show, tea and cakes (and the seating area around this stall.) They also enjoyed using the telescopes and visiting the other stalls. Our thanks to all who helped make our Festival successful. I went on the historical walk (which was absolutely brilliant) taken by Andy Brockman who informed us of the start of the Open Air School in Shrewsbury Park. I mentioned that I had attended the Open Air School when it moved to Charlton and was prompted to write a few lines on my memories of that time. I started there when I was 7 years old due to ill health after being involved in a serious accident. The main building (the offices, kitchen, infants dining room and nurses room) was built in brick and the hall and the classrooms (known as huts) were built of wood and glass. There was a gap between the walls and the roof of the huts (to ensure we had plenty of fresh air) which was fine in the summer but not good in winter as the heating was electric bar fires placed above the gaps so on a windy cold day most of the heat went out of the gap. On very cold days we were allowed blankets to wrap around us and could wear gloves to keep warm. There were several huts, one for each year you were in, and one was dedicated to woodwork which both boys and girls attended. Outside was a large field, trees, vegetable garden, flower garden, wildlife pond and large potting shed where on a Friday we sold the produce and flowers that we had grown and the funds went to the school to allow us to have day trips out. A typical day started with breakfast in the main hall followed by morning assembly then off to the huts. At 11am a short break for milk, lunch was at 12.45 followed by an hour’s rest time. We collected our camp bed and blanket and set them up in the playground in summertime or in the main hall in the winter. After an hour’s rest we went to afternoon lessons. Once finished we then returned to the main hall for tea before going home. This routine was set up as the main focus of the school was our health and our education came second. I hope this has given you a little taste of what it was like to attend an Open Air School. 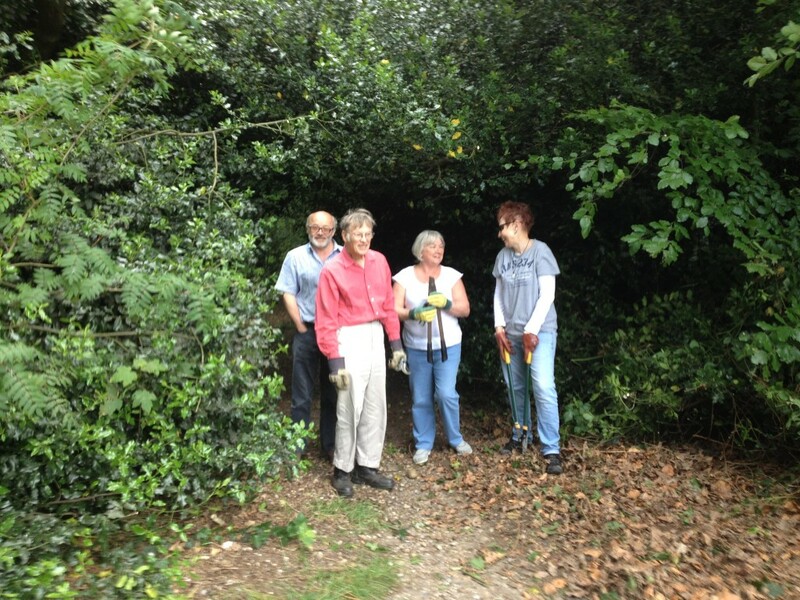 Members helped to cut back brambles and overgrown paths to help keep the park accessible. Thank you to all who took part. Each winter the bird boxes sited along Dot Hill path need to be checked and emptied in order to be ready for new occupants in the spring. 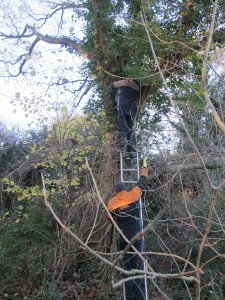 Martin and Peter came from the Council’s Parks and Open Spaces on 4 December to open and clean each box. We would like to thank Parks and Open Spaces for carrying out this annual service in their packed work schedule! It’s free to join, and you will be kept up to date with our activities. Help us keep the park beautiful by picking up your dog mess and your litter and putting it in the bins provided. 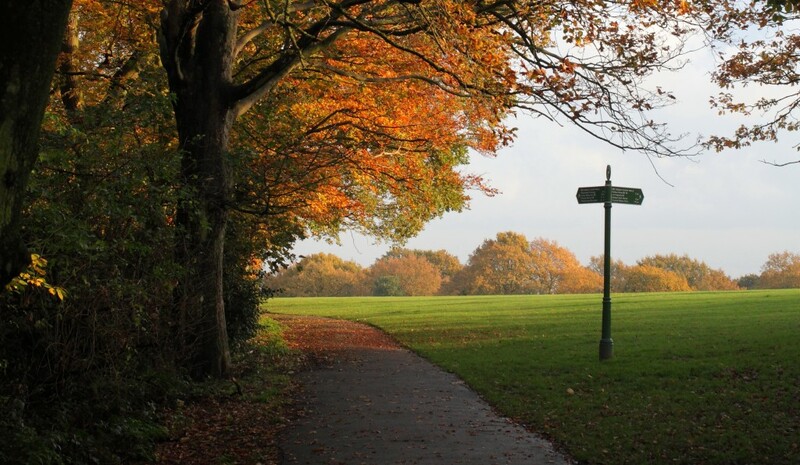 Join our park maintenance sessions.